BETHLEHEM — The morning’s first culprit drives a red utility truck towing a trailer down Delaware Avenue. It’s about 8:45 a.m. Jeffrey Vunck, a police officer who other cops joke is so strict he’d write his mother a ticket, has been driving maybe 10 seconds. The Crown Victoria lights up like a Christmas tree. Vunck hadn’t even pulled out of the police station’s driveway when he spotted the truck’s broken windshield. And what about those brake violations? And that unauthorized gas can? And that loose ladder? “You could probably write 10 tickets to this gentleman,” says Vunck. He won’t. But mercy isn’t what built Vunck’s legend. Year after year, in a suburb known for the dogged traffic enforcement of its police, Vunck is the top dog. The 20-year veteran, one of two officers focused on traffic, probably doubles the ticket output of his colleagues. He dispenses 150 to 250 a month, or as many as 2,000 tickets a year. The department sees Vunck, 46, as a motivated officer whose educational work is as valuable as his enforcement. Some who’ve been on the receiving end of that enforcement see him as an overzealous ticket czar. A fellow officer even printed bumper stickers with a catchphrase that spoofed his reputation: “You’ve been Vuncked.” That led to a running joke: How many tickets do I need to get a sticker? “Everybody knows that when you drive through town, you have to watch out for Officer Vunck,” said the junior of Bethlehem’s two traffic safety officers, Craig Sleurs. The 46-year-old contractor, whose red truck had the unsecured ladder and other violations, had only been in town about 15 minutes when he got Vuncked. Now, like so many before him, Weger listens as Vunck circles the truck and points out everything wrong with it. Vunck wears a Taser strapped to his left thigh because chemical spray, baton, radio, cuffs, keys, pager and ammunition fill his belt. But his tone is more friendly teacher than tough cop. At least that’s how it starts. Vunck says this is his general approach – explain everything that’s wrong, write up only the most serious stuff. Weger doesn’t act grateful. Vunck may only be ticketing him for two of 10 violations, but the fines for those two still could cost $700. This is the daily battle. Bethlehem’s reputation for aggressive enforcement can make these bat tles that much harder, Vunck says. Vunck’s own reputation – another police officer called him “the hammer,” a controversial figure loved by some and loathed by others – can also be a factor. Some think he writes everyone he pulls over. Some think he’s filling a quota. Some think police get all the fine money. All false, Vunck says. But the image leads to a Catch-22 of his job. Everybody wants the benefits of traffic safety. Nobody’s happy when that means Officer Vunck handing them one of his neatly written yellow invitations. Most would agree traffic is an issue in a suburb of 52 square miles that’s grown from 27,500 residents in 1990 to nearly 33,000 last year. Newer stores like the Wal-Mart super center on Route 9W also bring in more people. Vunck sees a traffic rush that begins earlier and ends later. Roads are more congested, driving more people to take shortcuts on residential side streets. Aggressive-driving complaints have increased. So has Bethlehem’s focus on the roads. The Police Department posted for its first traffic safety officer in 1990. The applicant they chose from within the department was a New York City cop’s son who had personally lost a relative because of a drunken driver: Jeffrey Vunck. 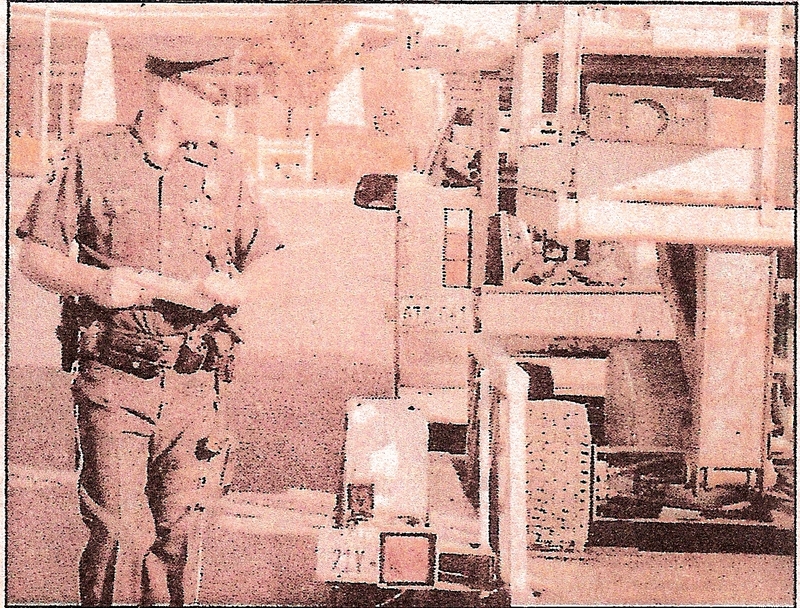 The Desert Storm combat veteran has been the primary face of traffic enforcement in town ever since. “The community benefits because the traffic enforcement has had an impact on our fatality rate,” said Lt. Thomas Heffernan, referring not just to Vunck. He credited Vunck with helping Bethlehem achieve seat belt compliance of roughly 94 percent. The town’s general fund also benefits from traffic enforcement, though the Police Department doesn’t feel that directly and the state takes a big cut. Bethlehem’s town justices collected $1,032,000 worth of fines in 2005, for example, and the town kept $549,000. It’s not clear what percentage of that is traffic- related. But the Town Court clerk, using this August’s receipts as an example, estimated 80 percent of the $91,851 monthly total derived from traffic fines. Enforcement aside, much of what Vunck does, most residents don’t see. He teaches at the police academy. He runs child safety-seat programs. He coaches elderly drivers with safety tips. But it’s drivers like Weger who probably voice their opinions about Vunck the loudest. One day after he got Vuncked on Delaware Avenue, the experience still riled him. The red truck that made him such an easy mark sat at a Mobil station, where Weger, in khaki work pants and a blue cap, was wrapping up a day of work. The contractor felt demeaned by a man he described as “hard-core,” divorced from reality, and “Mr. Judge and Jury.” What does Vunck do, he asked, make the Police Department thousands of dollars? Told of the “Vuncked” stickers, he asked where you get them.